“BUILD REMINGTON 700 SNIPER RIFLE” – This page originally started life as an actual website project titled “Build Remington 700 Sniper Rifle“. I was about to start ordering the parts when I stumbled across a complete rifle, a Remington 700 XCR Tactical Long Range 84462 which is a specific Remington 700 that I have wanted for some time. The purchase of that rifle makes the idea of spending a lot of money on something along the lines of a Remington M24 less interesting at this time. This page is now a theoretical build. All is not lost though. The Remington 700 Police 5R .308 Barreled Action listed below is still inbound for yet another project. Lastly the blue links as always will take you to the vendor or manufacturers website where I specified and would have ordered the parts. This Remington 700 Police 5R .308 Barreled Action features the classic 700 Remington action with 40X trigger and pairs it with a 5R-rifled barrel in one package. Perfect for hunting, tactical or precision shooting, or even just plinking, the Remington 700 in .308 is a flat-shooting rifle with a proven track record. Ideal for shooters of all ages and skill levels. Barrel length is 24″ with a 1 in 11″ twist rate, and is chambered in .308 Winchester. Trigger group is included with this package. The is the same rifle stock the United Stated Military utilizes on the Remington M24A2 SNIPER RIFLE. The results speak for themselves. Remington’s M-24 Sniper Weapon System is the finest long-range system available today. It delivers multiple-shot capacity with match rifle accuracy at extended ranges. In addition to the M24’s unsurpassed accuracy, it also offers reliability and durability under the harshest conditions of combat use and transportation. Designed for and used by the United States Military, the M24’s popularity also stretches from SWAT teams nationwide to International Military and Government agencies. Based on Remington’s legendary Model 700™ and 40-X™ rifles, famous for their “out of the box” accuracy, the M24 has quickly gained a reputation for precision among the sniper system community. An essential element in the M-24’s accuracy is its H-S Precision® aramid fiber-reinforced, fiberglass stock with an aluminum bedding block, is utilized for exceptional strength and dimensional stability in all weather conditions. The H-S Precision PST025 Rifle Stock was designed for police departments and law enforcement agencies. Stock is instantly and fully adjustable (no tools required) for length of pull and drop at comb. Plus, the hand filling, vertical grip and adjustable headpiece are ambidextrous for both right- and left-handed shooters. Machined aluminum bedding block runs from near the front swivel mount all the way back, into the pistol grip so no additional bedding is needed for superi­or accuracy. Kevlar/graphite-reinforced fiberglass provides stability and strength for a zero that never shifts due to changes in temperature or humidity. Barrel channel is relieved for straight contour, bull-style, heavy barrels up to 1.250″ in ­diameter. Available in Flat Black or Sand. It’s very important to note that unless a Remington 700 rifle stock was made (inlet) for a detachable box magazine from the factory a box detachable magazine bottom metal will require the stock have some sort of inletting. 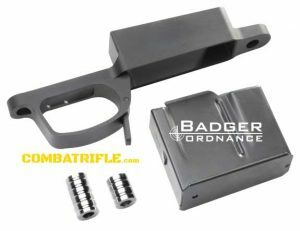 The Badger Ordnance M5 BDM Trigger Guard Bottom Metal is a heavy-duty guard similar to our M4 but allows quick loading/unloading via a 5 round magazine (included). It utilizes a time proven paddle-style mag release and will also accept 10 round magazines (short action version only). The M5 BDM includes Grade 5 TORX screws and bedding pillars to guarantee exact fit and perfect function. Machined from Aircraft Grade Aluminum and Mil Spec Anodized Hard Coat Type III finished. Inletting required. The Remington 40x Trigger is actually a very good trigger. It’s also the standard issue trigger for Remington 700 military and law enforcement sniper rifles. The results speak for themselves. No reason to replace the Remington 40X trigger unless it proves to be insufficient. 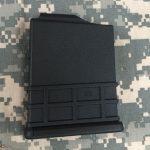 My first exposure to the MDT AICS Style 10RD 308 Polymer Magazines came by way of my MDT TAC21 20 inch Suppressed Modular Rifle project at sister website Modular Rifle. These magazines are a bargain compared to authentic AICS magazines. 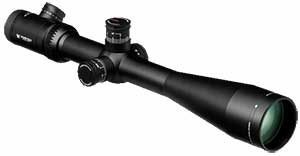 The Vortex Viper PST 6-24x50 FFP Riflescope EBR-1 MOA Reticle boasts features associated with top-tier riflescopes, yet comes in at a street price under the $1,000 mark. Matching reticle and turret measurements allow accurate, fast dialing of shots. The one-piece 30mm tube, precision-machined from a single solid block of aircraft-grade 6061-T6 aluminum, offers ample windage and elevation adjustment. 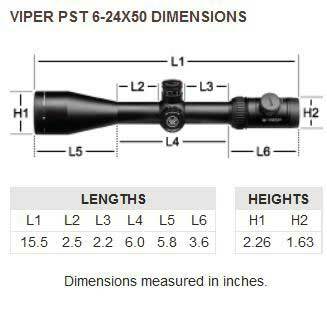 Born from an intimate understanding of riflescope design, forward-thinking engineering, and open ears to a market incredibly vocal about what it wants in a riflescope, the Viper PST series delivers the performance and features tactical shooters demand at an economical price. The Badger Ordnance 30mm Medium Scope Rings 306-20 are optimized for use with most 30mm optics in current use and accommodate precision rifles with medium and heavy contour barrel profiles. They are machined from Ordnance Grade Steel and Black Oxide finished. Heavy duty 30mm steel rings, machined in pairs, serial numbered, and designed specifically to securely hold large, heavy scopes on hard-recoiling guns. Weaver-style clamp with big ½” nut really snugs ring to the mount. 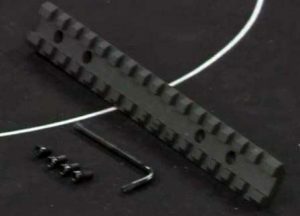 Ultra-High provides optimum height for AR-15, AR-10 and SR-25 rifles. The Badger Ordnance Medium Unimounts 306-62 are light weight due to both design and materials. By removing material without compromising strength and rigidity, the Unimount is an unparalleled scope mounting option. Billet machined from 6061 T6 Aluminum and Mil Spec Type III Hardcoat Anodized. These one-piece scope mounts from Badger Ordnance provide a rock-solid mount for scopes with 34mm tubes. Their monolithic construction withstands harsh recoil, and makes for easy mounting onto any Picatinny receiver rail. Available in two heights, both measured from bottom of mount to center of optic. 1.3″ height has built-in 20 MOA elevation. 1.49″ height has no MOA. Rings secure with 4 Torx® head screws each. Reducer rings, available separately, allow use on 30mm scope tubes. Includes installation wrench. [rail height + ring height] – [bell diameter x 0.5] If the value is positive, then your bell will clear the barrel. Optimally, you want that bell to be about 1/4″ or less over the barrel. This will give you a tight cheek weld and provide for more precise trajectory. Be sure to account for scope caps if you intend on using them. 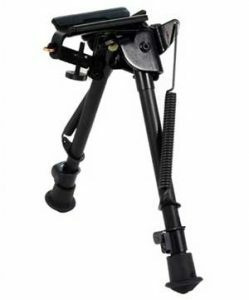 Harris LM-S Bipod – Ultra-light Harris Bipods are lightning quick and quality manufactured with heat treated steel and hard alloys. The bipods are quick-detachable and clamp to the QD stud of bolt action rifles with conventional stock design. Carrying your rifle with a sling or shooting off-hand is not impeded by the use of a Harris Bipod. Hinged bases have tension adjustment to eliminate tremor or looseness in the crotch area of the bipod. Bipods have an all-weather black anodized finish. • Ultralight weight 14 oz.